Today, I wanted to show you my garden/forest/trail, and tell you a little bit about it, and how much work I've done on it for the past 2 years. This year especially I've spent a lot of hours on this woods and expansion of the trail. 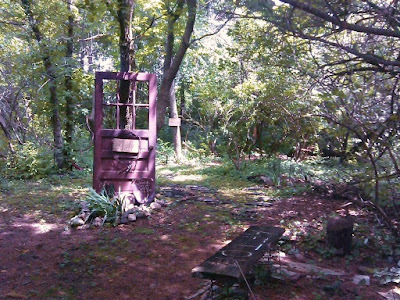 This shows the entrance from our yard. It's deeply wooded with mostly black walnut trees, but many other shrubs and trees intermingle. Two years ago, my husband simply mowed around the tree, which you see behind that brown door, it's nice, up until the mosquitoes emerge later in spring. I like to watch birds from the bench you see in front. 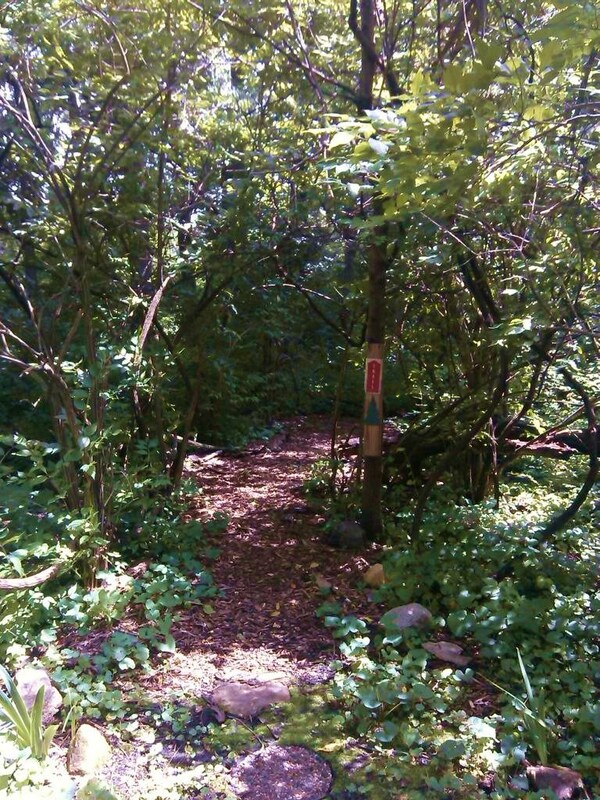 Gradually, that first year, I began working on a winding pathway through brush and black raspberry bushes, in order to come out the other side where the forest preserve drive is, and where the property ends. This is the beginning of a meandering, winding trail that I can only guess as being about 100 or so feet in length. The path is done in wood chips. I, myself, hauled dozens of wheelbarrows of wood chips from at least 100 yards away, doing maybe 4 to 6 loads in a day. In some cases I had a larger wheelbarrow, but I found that even though I could get more mulch into this, it was heavier. It wasn't so much about hauling it, as it was doing it all myself, building up muscles after a long winter, and exercise--which I never like to do, except when I see something as ends to a means. In other words, I don't want to get on a treadmill and go nowhere and have nothing to show for my time invested. I'd rather take a walk in the park and see nature. I'm not only a writer, but I was always an artist. When growing up my mother must have had a conniption with me, as I drew on walls. I have to laugh. If only she'd have gotten me some paper, I would have been happy with drawing on it. Anyway, to give you a little taste of my inventiveness, I'll show you some of my art work below. "MORNING AFTER THE NIGHT BEFORE"
I love glass especially old glass, which I'll show you in just a moment. 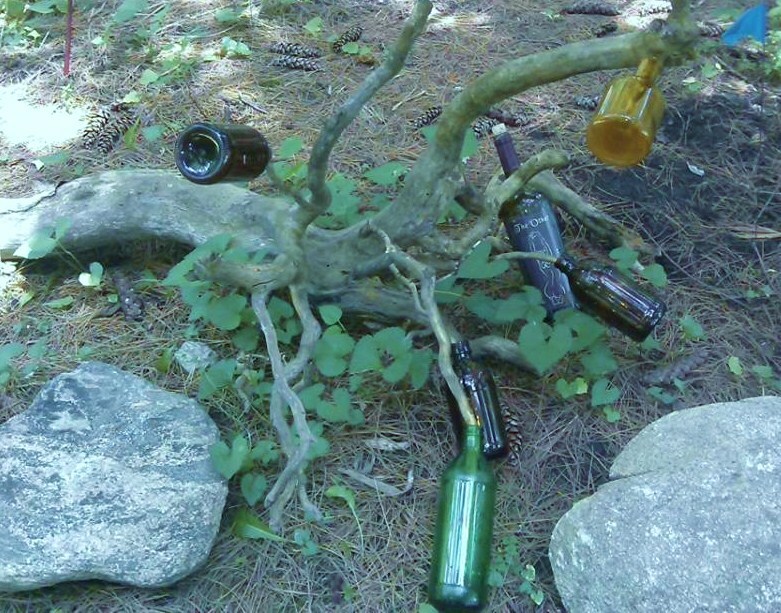 The twisted tree which I used to place the bottles on, is actually the root end of a tree. 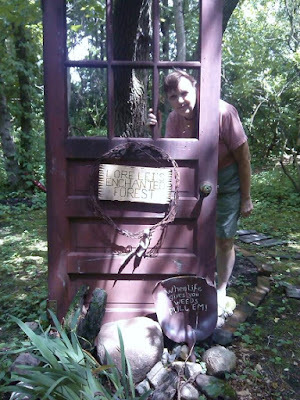 I saw it in a pile of debris, and told my husband I needed it for my garden. I sawed off, by hand, the other end of it, placed it where I wanted, and began adding old, or new bottles. The wine bottle you'll note has an interesting picture on it. "Morning After The Night Before" is the title. If you think about it, you'll get the joke, because mostly these are beer bottles. I have done crafts in one form or another over the years, and if I ever find another craft store nearby, I'll be working on getting my things into one soon. Below is an old shovel that I salvaged. Anyone else would toss such things. Me, I see potential. 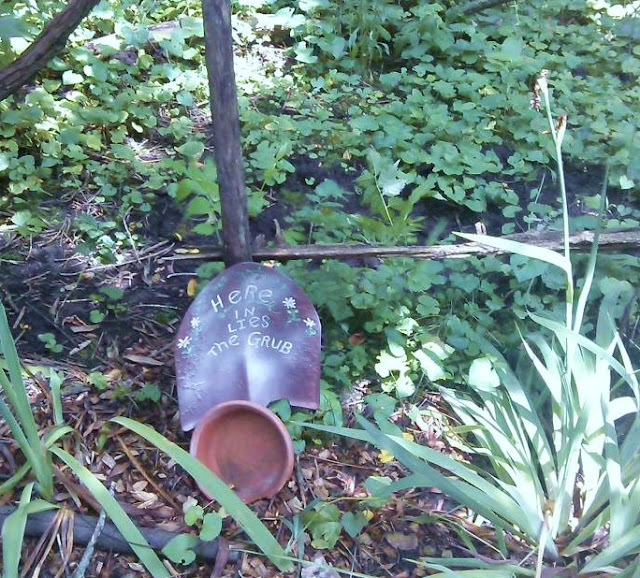 I chose to paint a little sign for the garden section, and tried to think of something that would be an interesting twist of the line "Herein lies the rub", and so "Here In Lies The Grub" worked. As you can see my old glass canning jar is suspended from a band that went around a whiskey barrel once upon a time. On either side of this are antique blue insulators--you remember when these were on electric and telephone poles? I'm also a rock hound. In front, below the glass jar is a rock that is almost perfectly round. 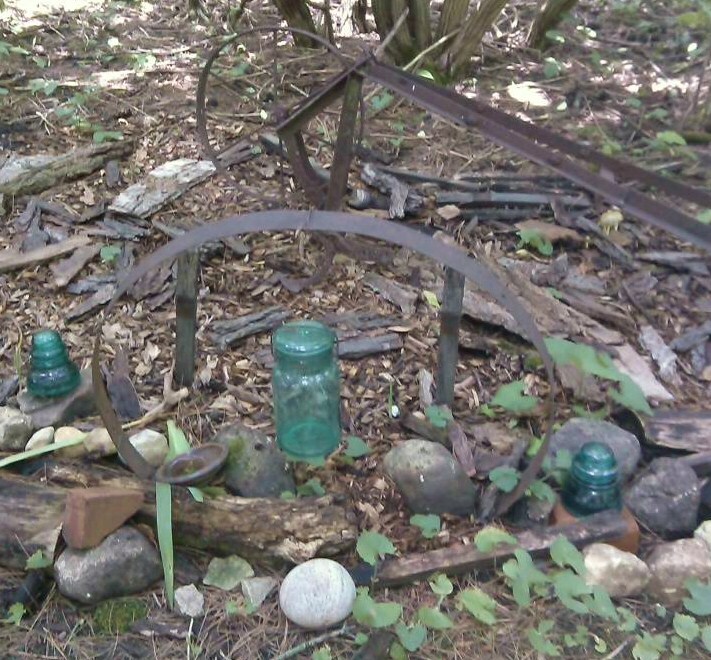 I find such treasures and put them in my garden where I like to display them as a focal point. 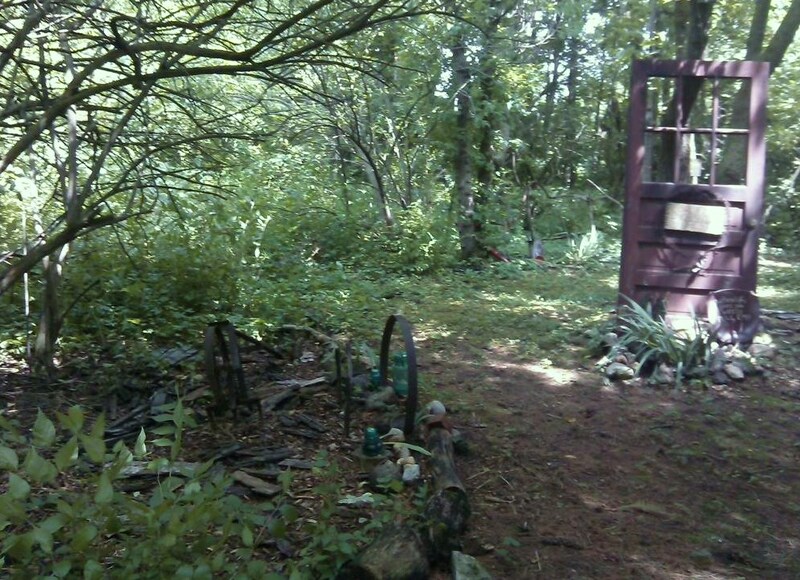 If you look behind these things, you'll see an old garden tiller. Believe it or not, I used to use this way back when I was younger, and it still worked, but at that time was probably an antique. Now it is so rusted the wheel won't turn. I'm a collector of the unusual, my tastes run eclectic. This is a view to the left side of the entrance. Where the photographer stands (and I'll give my sister-in-law, Kathy Bell, the credit for these photos, since I had no way of taking and sharing them myself), behind her is a stand of 4 or 5 mature white pines, which Dennis put into the ground about 20 years ago. Their needles fall every fall, and layer the area. Some needles coat the beginning of this entrance. To the left, further in, grows moss, and I've spent hours pulling the weeds out of the moss in order to encourage its growth as a lovely, spongy walk way. 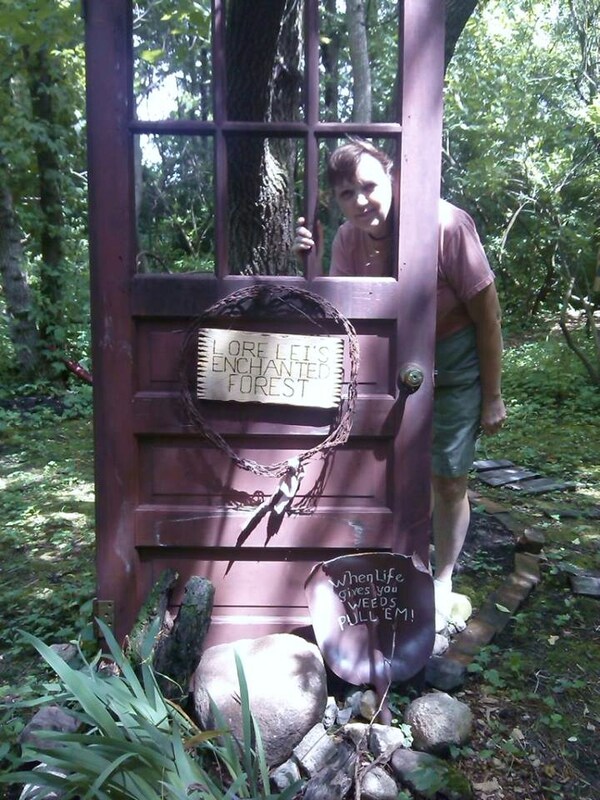 That's me behind the door, which I also salvaged from a burn pile. The two signs here I also made. The wooden one I used a wood burner and my carving set to make and it reads: "Lorelei's Enchanted Forest". Makes for an interesting focal point, don't you think? Another shovel below reads "When Life gives you Weeds Pull 'Em!" A lot of the rocks you see around my garden either I collected myself from either the field across the road, or they were ones I already had. The larger ones, my husband hauled up with a small tractor. I also dug up old bricks in a different area the year before and have used them in various places for my gardens. This sign is from the park's very beginnings, and they used to have bison - not buffalo - in the park. The story goes that one winter we had something like 70" to 80" of snow (I want to say this was the 79/80 blizzard, and I remember it), and the bison were able to escape their fence. So, they were never put back. I have no idea what was done with the animals. 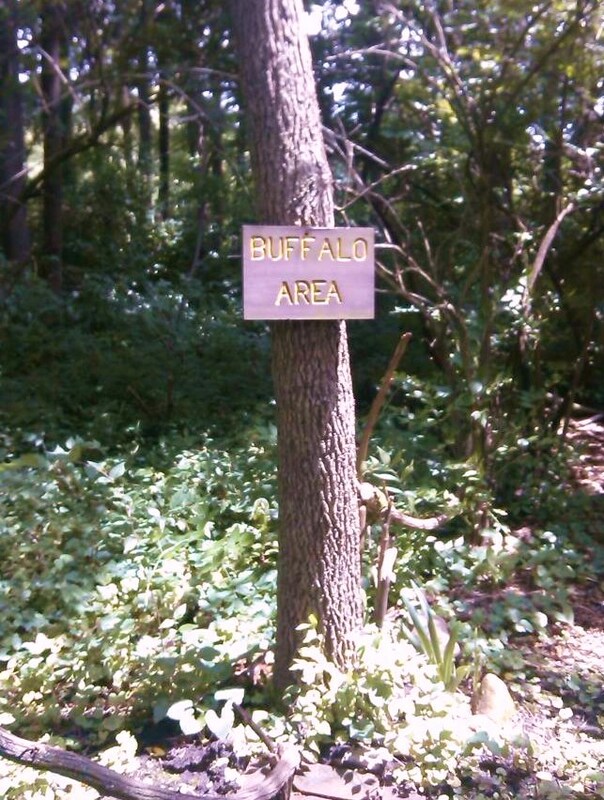 Anyway, Dennis, as a joke, put this sign up in the back part of the entrance. Well, I hope you've all enjoyed this tour of my forest/garden, and artwork. I've wanted to share with you what I've been working on during the spring. At this time of summer, when it's too hot and muggy out, I don't do much outdoor work. That's when I like to write. And, looks like I've spent enough time on this, so, I'll leave you all for time being. Have a good rest of the week! Lovely! What I wonderful place for the imagination to roam :-)! You've made it quite lively! All it's missing is a water slide. I could use one right now! Thanks Norma.